Taking care of your new roof is an easy way to save thousands of dollars. It is a major investment, so why wouldn’t you put effort into protecting it? A little information goes a long way when it comes to preventing roof damage. As one of the first lines of defense for a home, your roof should get absolute priority with maintenance duties. 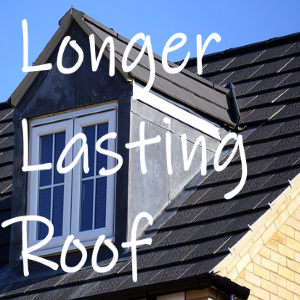 Do you know the lifespan of your roofing material? To get a better idea, asphalt roll is considered the weakest while slate or clay are considered the best. This is going strictly by expected lifespans, so personal wants for design are left out of the equation. By knowing what material is used to make up your roof, you’ll have a better idea of how to protect it. Using the wrong maintenance information on a roof will shave years off of its expected lifespan. Down the line, this could cost you almost as much as installing a brand-new roof! Have you ever heard of a re-roof? With this installation, new shingles are put over old ones. It has benefits with some pretty obvious drawbacks. People are split on the idea of a re-roof, but there is no denying the convenience and cost-effectiveness of doing so. If your new roof has all of a sudden had a minor ‘accident’ that isn’t covered by warranty, getting a re-roof is not an entirely bad idea. Of course, the logical thing to say in this situation is to avoid roofing work without a warranty! But for the less informed, a re-roof will cost you far less in the long run than ignoring the problem. Have you ever been in a building where there are buckets in designated places to catch water? When the weather is bad you can’t fix a roof, each minute that passes causes more damage. That means new roof owners should have a plan of action the moment fixing the roof is possible. You need to solve a roofing problem ASAP to prevent it from becoming a housing problem. Look at it like this- a roofing problem for a new roof is a minor inconvenience. A housing problem caused by a degrading roof is a nightmare. Homeowners that need a bucket will always need a backup plan. What Does Your Building Code Say? Now this one is sure to infuriate people that have had new roofing work done. Local codes seem to always get in the way of even the most minor house maintenance. Finding out about this at a later date will force you to dump a lot of money into bringing things up to code. If you don’t have the funds to handle this immediately, then you’ll be forced to pay a fine. By the time you actually get around to installing a new roof, you’ll have to settle for the cheapest materials possible. If you want to protect your new roof, then always make sure that you’re following the current laws of your city. There is no reason to mount a satellite dish on a roof anymore. A line of site issues hasn’t been a problem for years. Optional poles can be ordered with a satellite dish that it comes out of the ground instead of your brand-new roof. Think of the logic involved in bolting holes into a roof that cost thousands of dollars, even when there was a ground option. And in the event you go with a different company for television, you’ll have to remove the dish yourself. This has been the standing policy for years with multiple satellite providers. How many times have you walked outside of your home and didn’t even glance at the roof? Weeks go by, and you don’t notice the subtle changes like cracks, chips or other signs of degradation. Invest in a good ladder and a pair of gloves. You don’t need to look at it every single day, but a slight glance once in a while will do wonders. And in the event something needs to be checked out, you can go grab your ladder and make sure the roof isn’t problematic. Cleaning your gutter, keeping birds nest off of your roof and clearing packed snow should all be priorities. Do you have a low hanging branch hanging over your roof? Cut it, or else get a nasty surprise when the wind blows too hard. When you ignore mother nature, she makes you pay with a fiery wrath. And when it comes to roofing, mother nature is not your friend. The buildup from natural elements is one of the leading causes of roof damage. Remember, you have a strong roof to keep the outside…outside. Any type of roofing work that needs to be done should be handled by a professional. Simple maintenance is fine, but anything more than that needs a professional’s touch. There are still people falling through the floors of the attic in their home. Do you really want that same level of professionalism when dealing with an expensive roof? Take care of your new roof and it will become one of the most stable parts of your home. And always check in with the warranty to make sure that it is solid. Doing both of these things will only gain you positive benefits when taking care of your home. New roof installation is the beginning of a very long journey. So, what are you waiting for? A good roof is hard to find, but a well-maintained roof is hard to damage! Don’t waste money by letting your roof go to waste. A little care for an important part of your house protects it from being damaged throughout the year. Become more prepared as a homeowner by having the healthiest roof on the block.